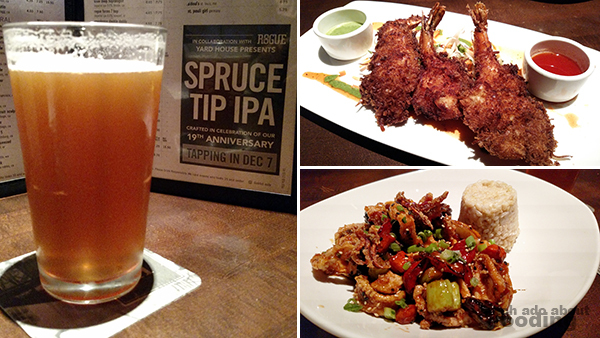 Did you know that Yard House made its debut 19 years ago in Long Beach at the Shoreline Village? Though I knew it was a restaurant chain, I was not aware of its roots so close to Orange County nor how long the company has been slinging brews and food at people. 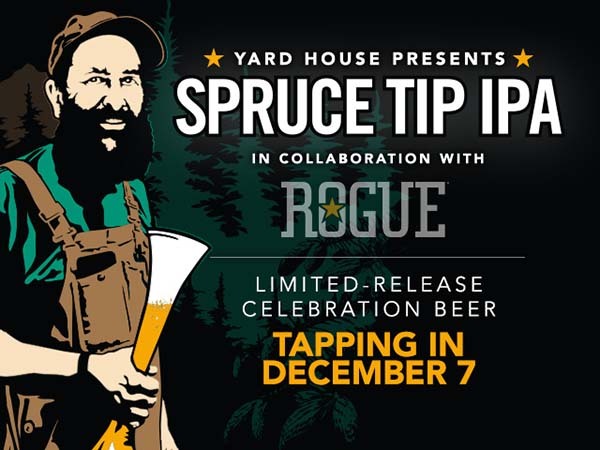 To celebrate its 19th anniversary, the flagship Yard House tapped a limited edition, limited release beer created in collaboration with Rogue Brewery from Oregon - the Spruce Tip IPA. Known for its hundreds of beers on tap and the beer yards they serve, Yard House's step into anniversary collaborations is well-welcomed and just the next step they have taken in providing their communities with as much craft beer as possible. We were invited in to give their newest addition to their beer list a try as well as explore their winter menu available from November 2nd to January 3rd. A collaboration between Executive Chef Carlito Jocson, Yard House Beverage Manager Gregory Howard, and Rogue Brewmaster John Maier, the commemorative brew joins the restaurant's Chalkboard Series of rotating seasonal and small-batch beers and is only around until January, if supplies last that long. IPA lovers will enjoy this brew but so will those who don't lean towards hops but can still tolerate them; in fact, as stout and porter lovers ourselves, Duc and I found that this was still a smooth drink that was clean and crisp without being overwhelmingly bitter. In fact, there was a bit of citrus zestiness to it and the telltale aroma of spruce. The hops did not overtake the flavor as some IPA tend to do, and the ease of drinking it made for a good reason for many to enjoy it despite preferences. To go along with our tall cold glasses, we got appetizers of their Coconut Shrimp ($13.45 - spicy green papaya salad, sweet chili sauce, and basil pesto) and Kung Pao Calamari ($11.75 - candied walnuts, red peppers, celery, carrots, and jasmine or brown rice) which both came with a little kick to them. Fortunately, the IPA cooled those down a bit. For the shrimp, the flavor in the batter was good as well as the shrimp itself but unfortunately it was fried just a wee bit too much and therefore too hard. The kung pao sauce on the calamari as well as the rings themselves was welcomed but the accompaniments fell into issues with being burned. The appetizers we had were part of the regular menu but the focus that evening was on the different holiday offerings that Yard House placed on their menus. Items added included favorites from various specials as well as autumnal/wintry inspirations. The ones we did not try were their Maui Pineapple Chicken ($19.75), Brown Sugar Old Fashioned, Ruby Sparkler, Rum Pumpkin Mule, and Za’atar Crusted Salmon ($25.25). For those that we tried, there were great aspects and some details that could mark your fancy or not. 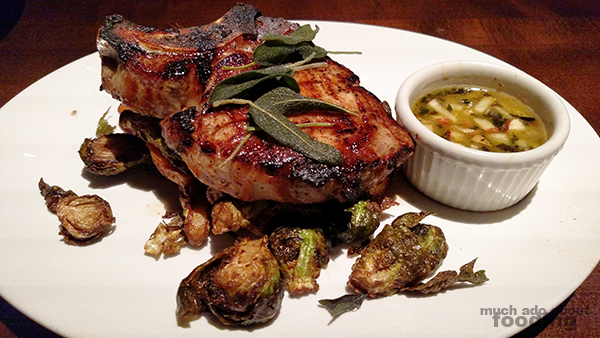 I was particularly fond of the Apple Cider Brined Pork Chop ($19.45 - 12-ounce pork chop grilled with red apple honey sauce, caramelized brussels sprouts, and roasted butternut squash simmered in brown butter) that came with crispy sage on top of the generous cut of pork. The meat on this dish was very juicy, imbued with the natural sweetness of apple cider that also used its acidity to tenderize the meat. The side of brussels sprouts was caramelized well, and hearty pieces of butternut squash underneath just cemented the wintry aspect of the dish. It was a comforting dish with a great balance of savory and sweet. 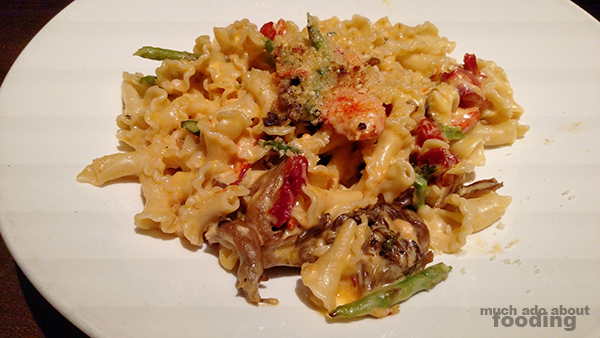 Duc went for their Lobster Mac N Cheese ($24.55 - campanelle pasta with sundried tomatoes, asparagus, fried wild mushrooms, Cheddar, and white truffle oil) which was originally a Valentine's Day special for Yard House. We guessed that by description only, the dish could be deceiving as traditional mac n cheese is baked and heavy on the cheese portions while this one took the dairy into more of a light sauce. There were steady pieces of lobster meat scattered about but the truffle oil was distracting and possibly not necessary. If you enjoy the sound of those ingredients together though, perhaps this dish is for you - after all, it is a popular special! 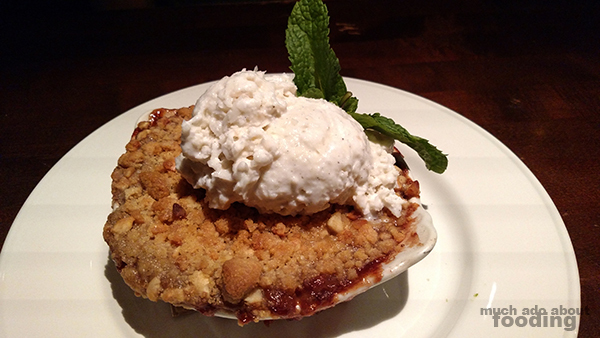 To end the evening, their Banana Berry Rum Macadamia Nut Crumble ($8.95 - topped with toasted coconut ice cream) made its appearance with plenty of bananas and strawberries below, macadamia nut crisp in the middle, and toasted coconut ice cream on top. The ice cream contained plenty of coconut pieces and those being toasted gave it a heftier taste. I enjoyed the crisp on top yet we both found the rum-infused "filling" below to be quite alcohol-heavy and unbalanced throughout the dessert. Overall, it was fitting for the season though and definitely is one to share with your tablemates due to its sheer size!